Like many of Red Lake’s other mining personalities, John Younglove Cole II came to Red Lake during the 1926-27 gold rush. 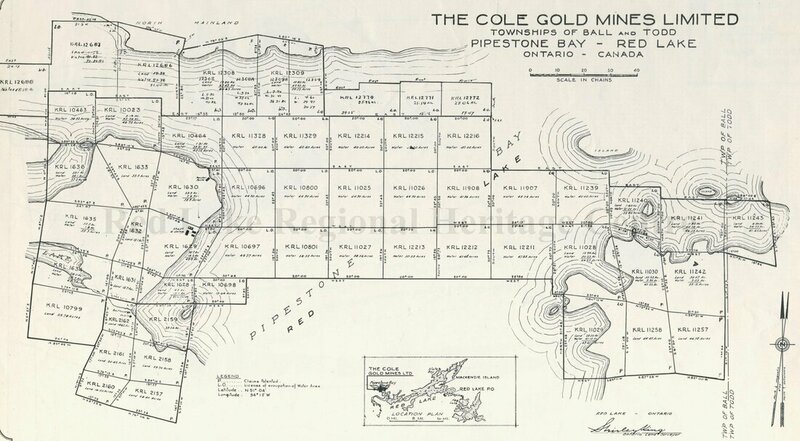 Cole settled on Pipestone Bay (west end of Red Lake) and staked 51 claims in early 1926. Over the next six years, exploration efforts consisted of surface prospecting, trenching, striping and sinking a six-metre (20 feet) shaft. In 1933 a new 60.9-metre (200 feet) shaft was sunk on the mine site and Cole Gold Mines incorporated in November of that year. By 1937 the shaft reached a depth of 530 feet, and the mine had completed over 2,133.6 metres (7000 feet) of drifting and crosscutting and over 1,219.2 metres (4,000 feet) of underground diamond drilling. Cole Gold Mines stopped work in the spring of 1938 and the property was abandoned. The Cole Gold Mines property has seen very little activity since 1938. The only documented exploration work on the site was done by Kerr Addison in 1973. The company completed both magnetometer and electromagnetic surveys as well as 2,108 metres (6,916 feet) of diamond drilling. Another mentionable occurrence was when John Y. Cole III, who was born on the mine site in the 1930’s, returned to visit his family’s mining project in 1986.